SimpliPhi have had another record-setting year with their installers and other partners! So they’ve decided to give something back this holiday season as a way of saying thank you and to support your business. All rebates will be paid directly to the purchasing installer. We can’t think of a better way to celebrate the holiday season than by showing our gratitude and working hard to help you close out 2018 on a positive note – and power up for 2019. We look forward to continuing to partner with you in the new year! To claim your rebate go to Give Thanks, Give Back. Give Thanks, Give Back rebates are available on purchases made between November 19 and December 21, 2018, while supplies last. SimpliPhi reserves the right to terminate the promotion at any time. 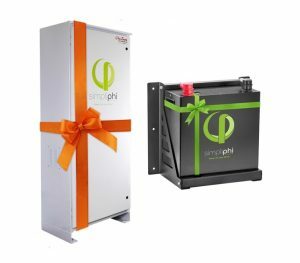 All rebate submissions must be uploaded onto our website by 11:59 p.m. PST on January 15, 2019 at https://simpliphipower.com/landing-page/give-thanks-give-back-rebate-2018/, including a copy of your invoice or purchase order from one of our distribution partners. All rebates will be postmarked by January 31st, 2019 or by the date of delivery.